Any idea on what could have cause this? Burned the Blu-ray from h.264 m2ts files at the highest quality setting. It took several hours for the production to render. Previously, I had burned to .iso, and got the same result. Switched to simply creating folders, and got the same result. Has anyone experienced this problem, and what is the cause? Intel Core 2 Quad processor, 2.4 Ghz, Nvidia GForce GT430, WD Caviar black 1GB HDD with plenty of space left. The audio sounds like a 33 1/3 record playing at 16 rpm. No warble or flutter, though! Anyone? I had to revert to using a competitor's product to make the disc, which was rendered without incident. I had never used My DVD in 2011, so this issue may have subsisted for awhile, and I was just not aware. Video- great, Menu- Works like a charm; Audio - there's my problem! The .wav file I used for the audio menu plays just fine, but when I click one of the links to play a an .m2ts file, the video pops right up, and is just beautiful, but the audio plays like it is at the wrong speed: slooooow. And the problem also exists when I play any .ts or .m2ts file with Cineplayer. Mediacenter, windows media player, VLC player, etc. play the files back just fine. The Roxio products choke on them. I have the Roxio product updated to the latest version. The production was a homemade production of the one of the bowl games, using h.264 m2ts files edited with Videoredo. The files are rather lenghty- one of them around 3 hours long (its a ballgame! ), and I would think that since I am producing a 25 gb blu-ray disc which is only half full with the production content, the .m2ts files would not even have to be remuxed by MyDVD to make the disc. Arcsoft Total Media Experience, produces a final blu- ray product in less than an hour: I had to leave MyDVD running all night to finish the same project. And again, video and menu worked just fine, but the slow audio plagued each linked video in the Blu- ray. Never actually burned the project to a disk. Created files and folders, and used Imgburn to create a mountable .iso file. Also produced an iso file using MyDVD. Same result. I am thinking this is going to be something so obvious that I am going to blush in humiliation when someone tells me what I am doing wrong. Go ahead, hit me! I am a big boy. What audio card do you have? Have you updated the drivers for it? Roxio doesn't like higher bit rate audio devices or videos with high bit rate audio. There are several instances where people have complained that the audio runs faster than the video (finishes in about half the time) but I don't remember one where it ran slow. 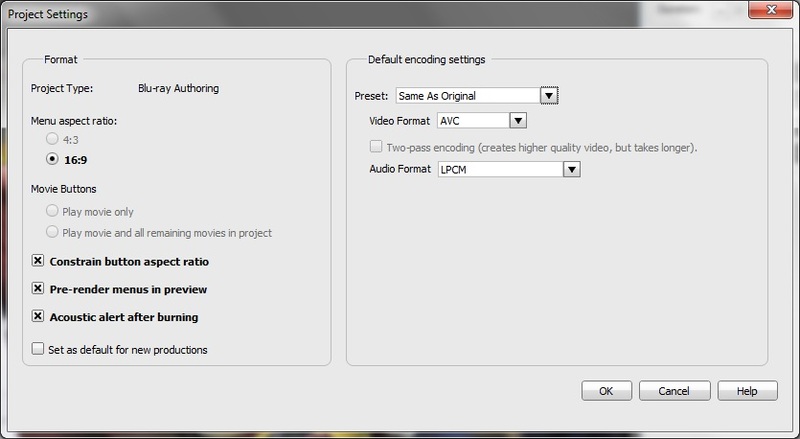 In some cases, encoding the video files to mpg2 using Video Copy and Convert solved the problem; in others, use of a free third party converter was needed (like Any Vidoe Converter). Can you provide any more information? My sound card is Creative Sound Blaster X-FI, driver version 6.0.1.1375, which is the latest version, as far as I know. What other information would be useful? I have previously posted my processor, memory, video card, etc. Mediainfo output from largest .m2ts file (pre- conversion) is attached (mediainfo). The files are not of the same size, admittedly, but MyDVD split the .m2ts files differently, than their original size. Mediainfo 2 is a post conversion m2ts file. Does MyDVD re-code the AAC audio to AC-3? I have attached an image of my project settings. I note that my project settings for audio format say LPCM. The other option is AC-3, and that is what the program appears to have output. Maybe that is my problem. Hopefully, someone who can interpret this information can help. Thanks in advance for any assistance that anyone can provide. Thoughts, anyone? FWIW, I installed Creator 2012 (yes, I know that is a differnt board but I think this is the same problem) on a different machine, burned essentially the same project (it may have rendered a little faster) and got exactly the same results. The later burn was on an AMD rig: AMD Phenom II X6 1075T, Radeon HD 5770 card, vidoe8GB RAM, Windows 7 Home Premium, using a RAIDED 8TB array with about 40 per cent capacity left. That rig has no sound card: the 5770 is doing the honors throught HDMI. Video great audio like a very slow speed record. You old guys will know what I mean with the phonograph analogy. How was the file captured? Can you post a sample file on Up For Down - Free File Hosting and Sharing - 10GB of free storage? I will upload a sample tonight. The original m2ts file was captured using the Hauppauge Colossus, streaming the output from my directv hr24-500.